What is the gospel (or good news) of Jesus? What is it precisely that makes this message good news to me? And how does a good message about a good guy who lived thousands of years ago actually bring change and hope to my real life today? Pastor and Author Matt Eachus addresses these and other important questions in his new ebook, eciple: Gospel. With humor and the inside perspective of a church-kid who grew to love Jesus, Matt helps Christians and non-Christians alike understand what the gospel of Jesus means to us today. 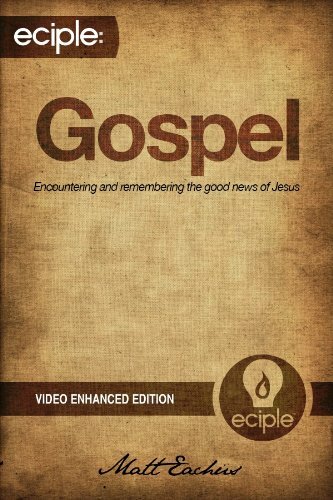 Through this compelling, video-enhanced version of eciple: Gospel, you will learn an expanded definition of “gospel,” will explore how the good news comes to the hearts and lives of ordinary people, and find hope for new life through the teachings of the Scriptures as Matt weaves his personal story, humor, and Scripture together to communicate clearly the life-changing power of Jesus. Matt is a Christian, husband, father, pastor, and author who thoroughly enjoys the busy life God has given him. Having spent his childhood in Southeast Pennsylvania, Matt graduated from Liberty University in 2001 and Liberty Baptist Theological Seminary in 2010.He currently serves as Lead Pastor of Temple Baptist Church in Halfmoon, NY, a growing multi-generational church in the Albany suburbs. He has a passion for teaching the Bible, for serving the church of Jesus, and seeing churches planted so that more people can know the life-changing power of the Gospel. A gifted speaker and teacher Matt has a heart for helping people understand the deep things of God in ways that connect with their real lives. He is hopeful that God would use him to be an encourager and equipper to the church at large. He and his wife, Amanda, live in Clifton Park, NY with their 4 young and very active children. They spend their days in a furious blur of T-ball, gymnastics, soccer, and school activities, all the while attempting to cherish each fleeting moment. In his downtime, he enjoys dark coffee, reading, hiking in the Adirondacks, and spending time with his family.